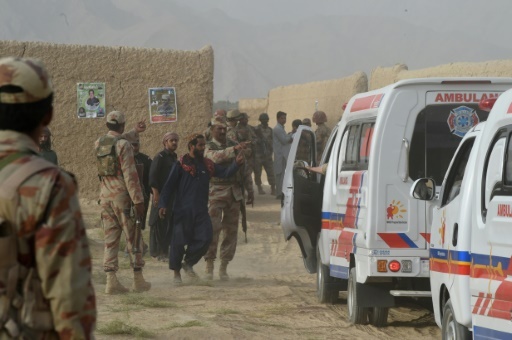 Mastung (Pakistan) (AFP) – Pakistan was in shock Saturday after a suicide blast killed 128 people, shaking confidence in security just as the dramatic arrest of ex-prime minister Nawaz Sharif ratcheted political tensions higher ahead of nationwide polls. Sharif’s highly-anticipated return from London and subsequent arrest for corruption was overshadowed as the carnage in Mastung, in the southwestern province of Balochistan, unfolded late Friday. Newspapers branded the blast — one of the deadliest in Pakistan’s history — a “massacre”, as analysts and media called on the military to, in the words of the daily Dawn, “do the job they are meant to do — ie preventing attacks”. One week ago, Sharif was sentenced in absentia to 10 years in prison on corruption charges. He was transferred to the garrison city of Rawalpindi, adjacent to Islamabad, after landing in Lahore Friday. Media reports said he was being held in a prison there. AFP / BANARAS KHAN. The attack in Mastung underscores ongoing challenges following years of optimism over improvements in security. Mobile signals were blocked and police deployed in the eastern city of Lahore where Sharif’s supporters had gathered as he landed. Soon after, the scale of the destruction in Mastung — hundreds of kilometres (miles) to the southwest, where an Islamic State suicide bomber had detonated at a crowded political rally — began to emerge. 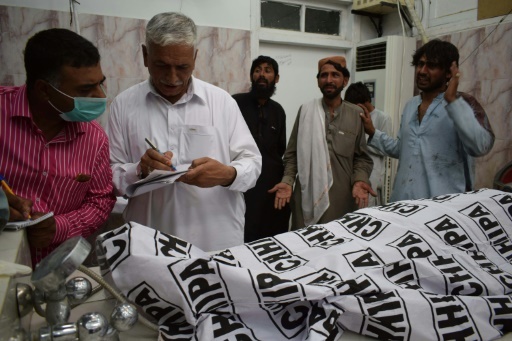 “It has never been more true that Pakistan’s security establishment needs to focus on security, not politics,” tweeted analyst Mosharraf Zaidi as mourners gathered to bury their dead in Mastung Saturday. More funerals were planned for the afternoon. Hospitals in the area have been placed under “emergency” management after being overwhelmed in the hours after the attack, with around 150 also wounded in the blast — many still in critical condition. “I could hear voices screaming. I tried to get up and I saw people trying to run towards the gate. They were trampling over dead bodies,” survivor Rustam Raisani told AFP from his hospital bed. AFP / BANARAS KHAN. 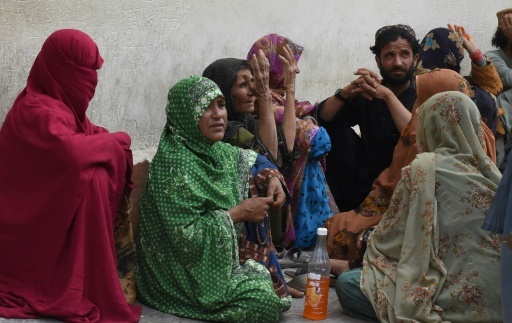 Relatives of people injured in the Mastung attack gather outside a hospital in Quetta. Sunday has been declared a day of mourning. “We have imposed emergency (management) in the hospitals and cancelled the vacations of the doctors and paramedics,” Balochistan home minister Agha Umar Bungalzai told AFP. The provincial home secretary Haider Shako added that extra security forces had been deployed in “sensitive areas” and warned politicians to remain “vigilant”. Security analyst Rahimullah Yusufzai termed the blasts a “wave of terror” that indicated coordination between militant groups, and noted that security forces could not protect every single campaign event. AFP / FAROOQ NAEEM. 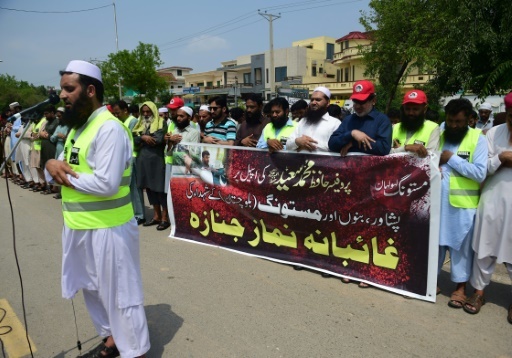 Activists of the banned Jamaat-ud-Dawa group offer absentia funeral prayers in Islamabad for victims of the Mastung bomb blast. But “they have been sidetracked,” he added of the military, and “criticised for taking sides and focusing on politics”. He predicted the bloodshed would continue “until the election and even after”. Violence has dropped significantly since the country’s deadliest-ever militant attack, an assault on a school in the northwestern city of Peshawar in 2014 that left more than 150 people dead, mostly children. But analysts have long warned that Pakistan is not getting to the root causes of extremism, and that militants retain the ability to carry out spectacular attacks like the blast in Mastung. “It has proved that the work that was required was not done,” the head of the Pakistan Peoples Party, Bilawal Bhutto-Zardari, said in televised comments on Saturday. He warned that unless terrorism is wiped out “these incidents will continue to happen”. Lahore resident Shahzad Anwar told AFP on Saturday that such an attack was the result of the “failure of security institutions”. AFP / AAMIR QURESHI. The return of ousted prime minister Nawaz Sharif is set to increase political tensions. “It’s wrong. It should not happen. The security institutions should work on this,” he said. 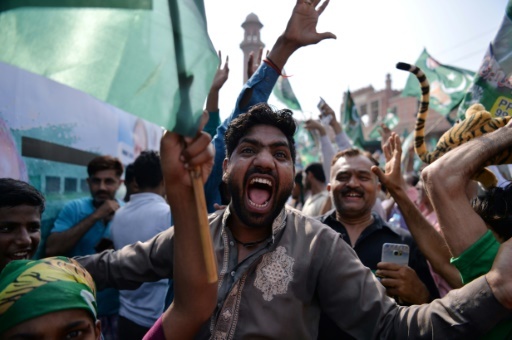 Sharif’s return is set to increase political tensions as his Pakistan Muslim League-Nawaz seeks to fend off a challenge from the party of cricketer-turned-politician Imran Khan at the polls. Sharif has been banned from holding political office, but analysts have said his return is aimed at reinvigorating support for his party, now led by younger brother Shahbaz, which is limping towards the vote after a lacklustre campaign. The military has already warned of a security threat in the run-up to the vote, and said it will deploy more than 370,000 soldiers on polling day. Featured Photo: AFP/File / BANARAS KHAN. The attack was the deadliest since a Taliban assault on a school in the northwestern city of Peshawar in 2014 that killed over 150 people.